"Cabbage leaves are stuffed with ground beef, rice, then simmered in tomato soup. Works great in the oven or a slow cooker. Serve with pan juices and a drizzle of sour cream, or mix the pan juices with sour cream and ladle it over the cabbage rolls. Also, good with mashed potatoes and cucumber and sour cream salad. 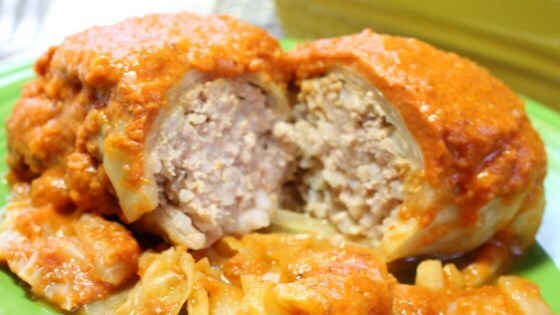 Cabbage rolls freeze well before or after cooking." Bring a large pot of lightly salted water to a boil. Place cabbage head into water, cover pot, and cook until cabbage leaves are slightly softened enough to remove from head, 3 minutes. Remove cabbage from pot and let cabbage sit until leaves are cool enough to handle, about 10 minutes. Remove 18 whole leaves from the cabbage head, cutting out any thick tough center ribs. Set whole leaves aside. Chop the remainder of the cabbage head and spread it in the bottom of a casserole dish. Melt butter in a large skillet over medium-high heat. Cook and stir onion in hot butter until tender, 5 to 10 minutes. Cool. Stir onion, beef, pork, rice, garlic, 1 teaspoon salt, and 1/4 teaspoon pepper together in a large bowl. Place about 1/2 cup beef mixture on a cabbage leaf. Roll cabbage around beef mixture, tucking in sides to create an envelope around the meat. Repeat with remaining leaves and meat mixture. Place cabbage rolls in a layer atop the chopped cabbage in the casserole dish; season rolls with salt and black pepper. Whisk tomato soup, tomato juice, and ketchup together in a bowl. Pour tomato soup mixture over cabbage rolls and cover dish wish aluminum foil. Bake in the preheated oven until cabbage is tender and meat is cooked through, about 1 hour. Cover the baking dish tightly so that the cabbage can steam and get tender, then uncover for the last 20 to 30 minutes of cooking. Definitely use tomato soup, and add a can of tomato juice for every can of tomato soup. I did not get to eat this, but my husband and kids did and they gave it 4 stars! They seemed to really enjoy it, thanks!